A primary concern preparing for a major hike (or even a minor one!) is food. How much to carry? Do I make it myself? Do I buy it on the trail? Now despite the heading of this little section, I won’t pretend to have decided how I’m going resupply for the totality of my hike. But I have read enough to know that having at least some food laid in before leaving is not a terrible idea. 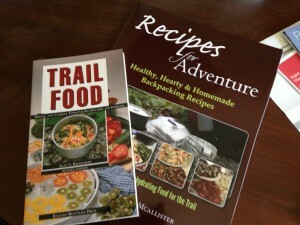 Pursuing the idea of preparing food for hiking, I delved into some (tasty) research. Namely – what DO hikers eat out there? Turns out stories about craving Snickers, peanut butter, and cheese abound. Once you get past these three food groups, however, you fall into the wonderful, foreign world of dried food. 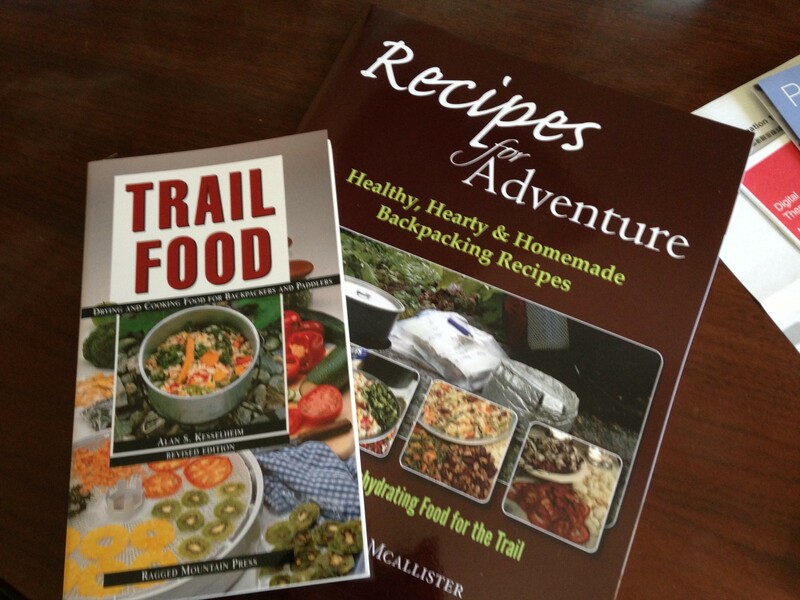 To give due credit where credit is due, the most useful books in my quest to understand backpacking food have been “Trail Food” by Alan Kesselheim and “Recipes for Adventure” by Chef Glenn McAllister. Chef McAllister also maintains a wonderful website AND responded most graciously when I used the website’s comment box to thank him for sharing his knowledge so freely and so clearly. Research is more fun when it involves food! Exhaustive research has lead me to the basic conclusion that weight=bad, food=good, therefore food that weighs as little as possible is best. What weighs most food down? Water. How does one get rid of excess water and maintain deliciousness (to say nothing of nutritional value)? One dehydrates it! 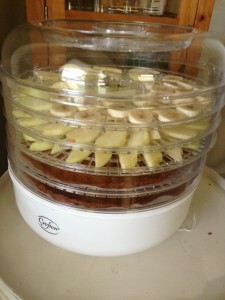 New gadgets are most exciting, so I was stoked to borrow a dehydrator from my friend, Jen. Unfortunately, this particular Crofton decided to pitch a hissy fit and die the first time I plugged it in (sorry Jen). In retrospect, the untimely demise of this machine wasn’t all bad. This model does not have an interior fan, temperature control, or a timer. It is the most basic of basic dehydrators (unless you’re drying things in your yard in the sun), and not exactly what one needs to process a great deal of different types of food for a long trip. 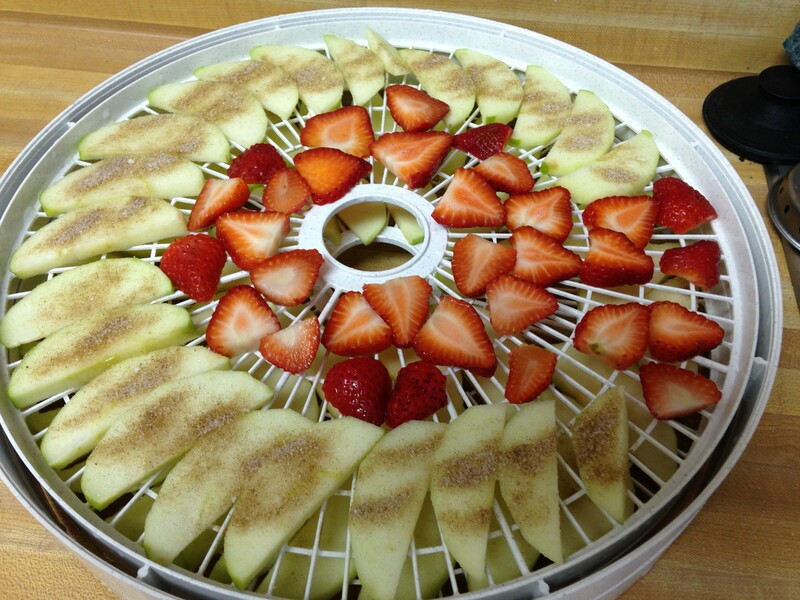 Besides Amazon, where does one go to buy a dehydrator in Columbus, OH? I’ll tell you – City Folks Farm Shop. Not only did the store carry dehydrators in stock, when I called to inquire the owner ripped open the box and pulled out the machine to see if it definitely had the features I wanted before I drove halfway across the city to buy it. I really appreciated this extra help from the owner and hope she knows that! All of my kitchen appliances have Italian names and all of my other electronic gadgets have Russian names. I blame this on my first iPod which popped a screen open on my computer when plugged in for the first time which said, “What is iPod’s name?” Since then, I have christened Dmitri (iPod 1), Vladimir (iPod 2 – life cut short when a thief stole him away), Boris (iPod 3), Stanislas (Kindle), Maestro (Kitchen Aid Mixer), and Roberto (rolling pin), among others. Alessandro is a Nesco Digital Dehydrator. It has four tiers, an electric fan, timer, and temperature control. So far together, we have made a variety of dehydrated fruits and a trial run of beef jerky. Notice the apples in the middle picture have brown on them. That’s not oxidation – that’s a sprinkle of cinnamon sugar. They were delicious. The strawberries were also amazing – dehydrating them concentrates their tasty goodness and gives you a little something to actually chew on before you’re done. The nectarines were also surprisingly good. I threw them in on a whim (and because they seemed close to turning) and am now looking forward to dehydrating many more of them in the future. The bananas were the only disappointment -they were too banana-y for me. I recognize banana-y is not a real word, but there is no other way to describe what dried bananas taste like. Except perhaps if you imagine a banana popsicle, then make that flavor leathery and chewy. No dried bananas will be accompanying me on the AT. Or anywhere else for that matter. 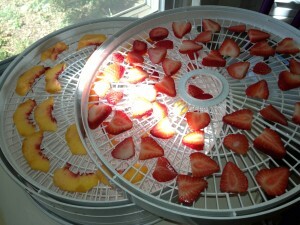 The fruit dries for about 6 hours at 140-145 degrees. To prevent spoilage for longer storage, Chef Glenn recommends storing foods in air tight containers or vacuum sealing them. Since I am still experimenting, I have been eating my dried concoctions as snacks the day and the few days after they are made. No need for vacuum sealing yet! 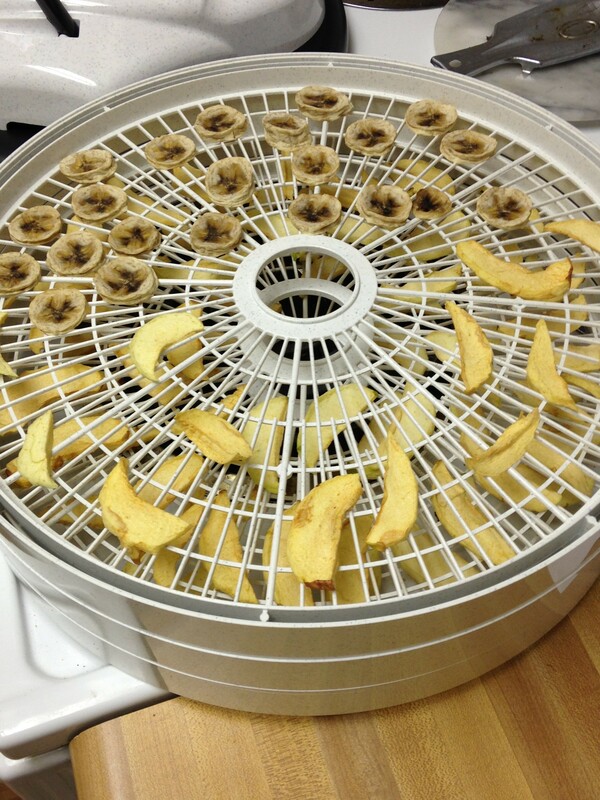 Drying food is fun, the prep work is easy, and the resulting fruits are delicious. The prepackaged jerky seasoning I used was too salty, so back to the drawing board there, but I am excited to try again. I am further excited to delve into some of the more complex recipes that can be dried – things as varied as chili, pumpkin pie “bark”, and beef stew. Who knew? Depending on how my experiments over the next few weeks go, I will decide whether to rely more heavily on maildrops or town stores for my resupply. Regardless, I’m looking forward to developing my dehydrating skills and can’t wait to see what Alessandro Caldo can do next! I’ve toyed with drying food and have one of the books you recommend for recipe ideas. I also bought a vacuum sealer. On last summer’s shakedown hike I packaged a quarter cup of freeze dried chicken and a cup of dried veggies. On the trail I combined this with three quarters of a cup of instant rice, instant cheese grits or ramen noodles with a half a bouillon cube. I figured these would be commonly available. Worked great! can anyone recommend a good dehydrator that wont break the bank? 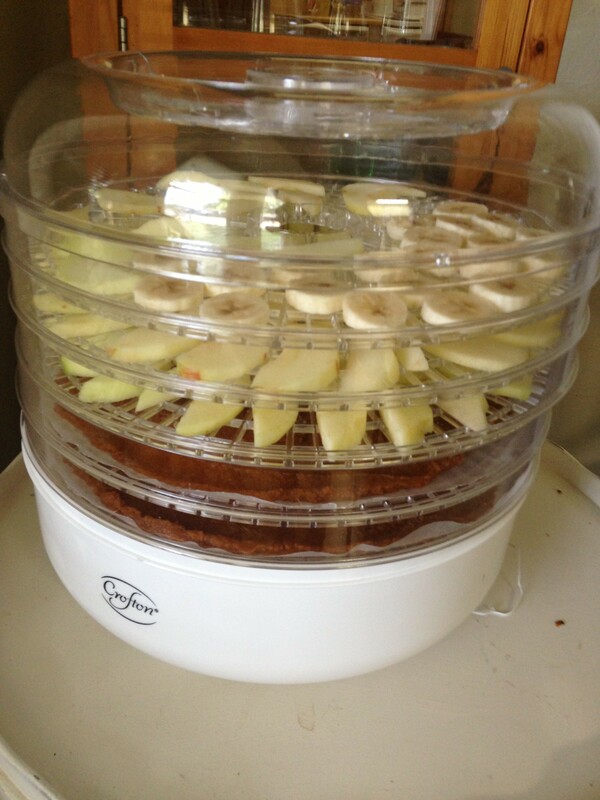 Mine is a Nesco Digital Dehydrator ($99) and I love it. However, the Excalibur models are supposed to be beyond amazing and the square (as opposed to round trays) are apparently much easier to work with if you’re making things that start as liquids (e.g., fruit leathers or bark). I made all my own food for my LASH (850 miles) this summer. It was very difficult to prep ~2.5 months of dinners, but it was sooo worth it. 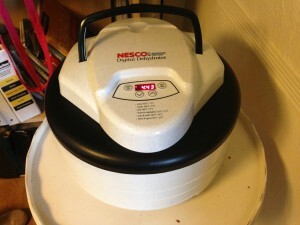 I used the Nesco American Harvest which has no temp control but is cheap. I bought the 2 extra trays and it basically ran night and day for a while. You can make your own instant rice, bean stews and chilis work well, instant mashed potatoes (white or sweet! )… pretty much anything you can get in a Mountain House etc. meal. I have Celiac and am pretty health conscious so I wasn’t down with ramen and pop tarts. I think it paid off because 1. I never got sick of my meals and 2. I wasn’t psycho crazy craving things. I think the hikers who are having insane cravings are essentially malnourished so their bodies just Want anything to get some nutrients out of. The only things I craved were lemons and green vegetables. I def ate my fair share of snickers though. Often dipped in nutella. I am hoping to try dehydrating lots for my 2016 thru as well – keep us posted on your adventures with Alessandro! !